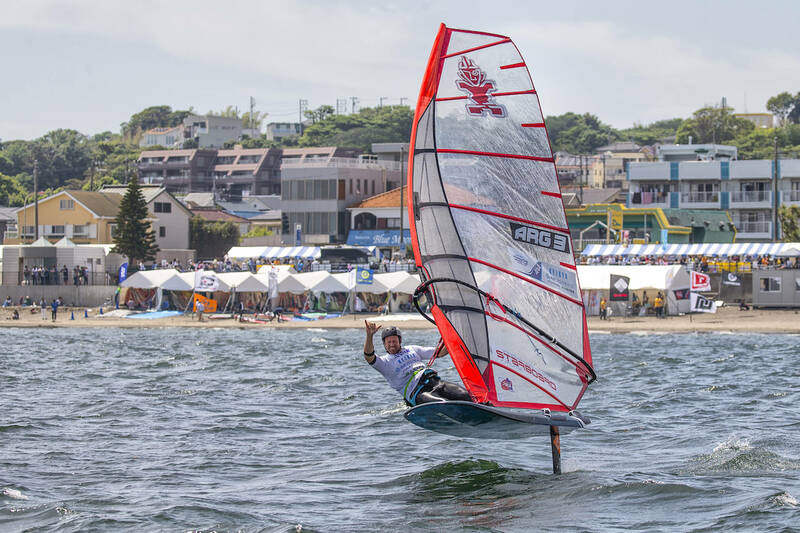 This season the Foil fleet competed for the first official PWA Foil World Championship, which saw the best foilers in the world battle it out on 4 occasions across 2 continents - Japan, South Korea, Costa Brava, Spain and Sylt, Germany. Hey Gonzalo, how’s it going? All good! back with my family in Tarifa! Very relaxed now! How does it feel to be the first official PWA Foil World Champion? Feels amazing! I always had the dream of winning a PWA title and becoming the very first one in Foil makes it even more special! In the end it finished very tight for the title between yourself and Basti [Kördel] - was that a nervous wait on the last day? Yes!!! it was a long day!! The forecast said that the wind was not going to stay long so most likely we were going to have some more foil racing. I was “mentally” prepared for it, so i had everything ready and was pretty calm. But then the waves were too big so we couldn’t go in. So it was pretty stressful watching the waves all day!! Sylt ended up being your discard - what do you think happened? At first I was pretty relaxed as I felt really prepared for the event. I had trained a lot and my gear was feeling super good. I did some events after Costa Brava to stay active and won them all, so I was confident I was prepared. The event in Sylt is very particular, is very long. We have all the disciplines there, so it’s hard to predict how much racing we will have. I knew that the days we were going to be foiling could be very limited but the forecast kept on changing all the time and that plays on your mind, adding a bit more pressure knowing you can’t afford to screw up. I had some bad decisions regards my trim and it was not easy to come back to change, kind of got caught with too much power on all my trim the first day. The second day I took a more conservative trim and I could have gone with a lot more power. Regards starts and racing decisions I was pretty conservative, I didn’t want to be too far away from my main opponents for the overall, so tactically that didn’t help me to have great races but in the end i took the overall tittle and that was my goal! Every event this year saw a different champion - which makes it quite exciting and hard to predict from a spectators point of view - do you think that that trend will continue next season or do you think it will become like Slalom where there are a few big names dominating the top? I think it will continue like this year, many guys will be able to win an event. And that’s super exciting to see I think. The level will be higher and a lot more guys will come in from other disciplines, so yes I think it will be super exciting! This season has seen a variety of wind strengths and some variation in courses… what would you say your favourite foiling conditions are? I liked the powered up races in Japan and Korea, with flat water and gusty winds, so it was very fast and tactical. The crossings were close, and I think the racing was on a different level, a level of excitement we had never experienced before. I liked the windy race in CB that I won too, I think that because I live in Tarifa I am many times in the water foiling even when it’s windy, so whenever we had windy races this year I was up there getting top spots. It’s always nice to feel you are good when it gets hairy…! Where was your favourite event of the year and some of the highlights? I think I liked Japan the most and the M course race we did there was definitely the highlight of the season for me. It was super challenging and there was a lot of lead changes but I took it in the end. Did you have any low points on tour? I left Costa Brava with a sour feeling as i finished 6th and I knew I could have done a lot better. What is the best thing about being on tour? I love competing in different locations and meeting passionate windsurfers around the world is pretty cool too. You are working on R&D for both Starboard/Severne and Foil - what would the main differences be for example between a Slalom sail and a dedicated Foil sail? We worked very hard on our foil range with Starboard/Severne and Starboard Foils. I am very happy how all my gear worked. All our stuff is super easy to sail, so in the end that helps you to win races, especially on foil you need to be very comfortable all the time…if you are fighting with your gear then it is impossible to have a good race. The Hyper Glyde, our dedicated foil sail from Severne has a bigger range, a softer feel, a tighter leech and an overall easiness when on air compared to our Mach1, our slalom dedicated sail. We won 3 out of 4 PWA events so i think we did a very good job. How did you celebrate winning the first official Foil world title? I had a nice dinner with most of my friends on the last day in Sylt, we are competitors but when the contest is done most of us are super good friends. Then I think I celebrated the whole last week with my wife and baby, just enjoying time with them. What will you be up to over the winter months? I will go to Argentina to visit my family and friends, haven't been there for a while! And I am most probably going to Australia all of January and February to the Severne head quarters with Matteo [Iachino[, to start the early development for ’20 and to prepare for the ’19 season. Thanks for the interview Gonzalo and congrats again on winning your first Foil world title! Have a great winter and see you next season!